Family meals are worth the effort! The benefits can last a lifetime. Erin is a nurse practitioner dual certified in family practice and women’s health and currently sees patients at Minnesota Personalized Medicine. She is also Co-Owner and Co-Founder of Mom Enough®️, an evidence-based parenting blog. Do you ever wonder if it’s really worth the effort to have a regular family meal? After your hard work in the kitchen, are your children done eating within 5 minutes of the food hitting the table and begging to leave? If you can relate, know that you're not alone. Also know that in spite of what might feel like a futile effort, the time spent on meals is well worth it. My oldest son stands over his food, adding ketchup. To. Every. Thing. When he eventually sits, he sits at least one foot away from the table, leaving plenty of room for food to fall from his fork to his lap. My youngest has a habit of stripping down to his skivvies the second he gets home from school. He puts on a fuzzy blanket for mealtime and entertains our table with jokes that are just shy of appropriate. My husband sits quietly, taking it all in. I breathe deeply between bites and waffle from stifling a laugh at the inappropriate jokes to biting my tongue when the oldest spills again. This may all sound like a disaster. Can you relate?! Nonetheless, I find family meal time precious. It’s usually entertaining, it’s one of the few times we’re all together, and the wellbeing benefits are absolutely worth the occasional frustrations. Improved nutrition (e.g., eating more fruits, vegetables, dairy, and micronutrients). Lower consumption of sweets and sugar-sweetened beverages. Lower risk of being overweight or obese. Decreased risk of disordered eating behaviors. Improved psychosocial outcomes such as decreased alcohol, tobacco, and substance use; depression; and suicidal thoughts. You may want to add to the list that mealtimes are associated with parent frustration. I totally get it. But, don’t give them up! Below you’ll find five tried and true tips to get the benefits, reduce the frustration, and make the most of your family meals. Plan weekday meals on the weekend. As you plan, find ways to use leftovers in the next few meals. A roasted chicken on Monday makes for tasty sandwiches on Tuesday and a chicken stock on Wednesday. Cook in bulk. Cook extra family-sized portions and tuck them in the freezer for busy nights. You’ll feel relief when you can throw a frozen, homemade soup in a pot and save meal prep time amidst a weekend packed with activities. Plan together. Ask your kids to identify recipes they would like to try. Gamify this process by setting a maximum number of ingredients or requiring a specific ingredient to be used in the recipe. They’ll have fun with the challenge and will likely be more excited to try the new dish. Kids who participate in the cooking process are more likely to eat the meal. Growing food together can make the food even more enticing and helps kids understand how to create healthy, whole-food meals. Don’t worry if you’re garden-less. Try growing windowsill herbs or place a small, potted tomato plant in a sunny place outside. When the food gets to the table, your kids can take pride in knowing they were involved every step of the way. It can take about 10 attempts to develop a taste for something. Encourage your children to try new things, over, and over again (at least 10 times!). 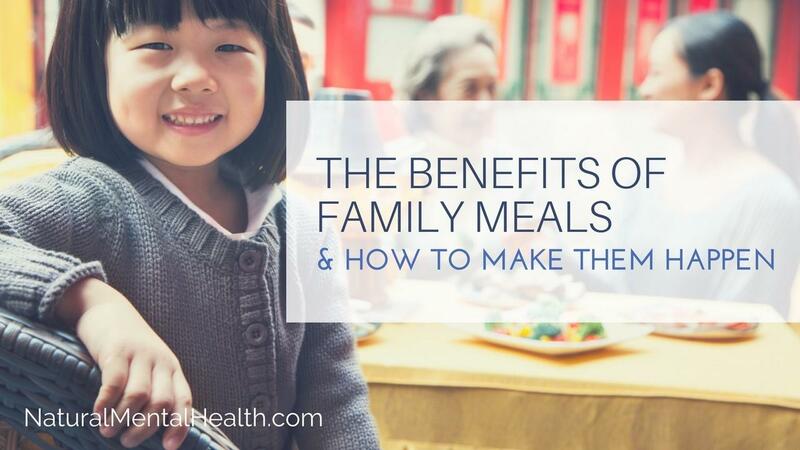 Family meals are a great time to model healthy eating behavior. Research shows that children who observe parents eating healthy meals are more likely to eat healthfully themselves. So, grab a fork and show them how it’s done. Keep a device basket on the counter. Before a meal, everyone silences their devices and places them in the basket. Sub a playlist for the TV. Research shows that eating while watching television is associated with less healthful meals. Offer more healthy sounds by creating a mealtime playlist and play at a low enough volume so that you can still talk together. Make this a family activity by letting each person pick a song for the playlist. Ask questions. Keep a question jar on the counter and encourage everyone to add meaningful questions to it whenever they like. Pluck a few out during a meal and let the questions inspire your mealtime conversations. So, no matter if you’re squeezed around a make-shift table or scrambling to find time to both prepare food and eat it, remember the benefits that come from a meal together. Relish the quirks (ketchup, anyone?) and let family meals be a precious and healthy family activity during your busy week.